Everyone knows about the benefits (comfort, luxury, and energy efficiency) of floor heating, yet very few people know how it works. The truth is, it’s really simple. Essentially, a heating element is installed beneath a floor. When activated, the heating element turns the entire surface of the floor into a “heat bank” that radiates heat throughout a room. See? Easy-peasy. The short answer is this. The best time to install floor heating is when you put in a new floor. If you’re already planning on installing a new floor, then the cost of putting in electric radiant heating is surprisingly affordable. The only additional cost is for the heating system itself and the labor to install it. You’ll recoup those costs in no time with your energy savings, due to the efficient nature of electric underfloor heating. So, when do people put in new floors? There are three primary times that usually correlate with a new floor installation: building a new home, remodeling an existing one, and putting an addition on a home. Building a new home is like any project that you begin from scratch—you’re only limited by your imagination (and the local zoning code). You can choose everything, from the size and location of your rooms to the flooring and paint used. Similarly, incorporating floor heating into a new home means that the sky’s the limit. WarmlyYours offers a radiant heating system for any type of floor, such as TempZone™ for tile, marble, stone, and nailed hardwood, or Environ™ for laminate, floating wood, and carpet (U.S. only). A new construction project might also include ground-level, finished cement floors, which is perfect for our Slab Heating system. The Prodeso Membrane helps improve floor lifetime. Remodeling can happen for any number of reasons, but a lot of remodeling occurs when someone is either trying to sell a home or has recently purchased one. For those trying to sell a home, incorporating a floor heating system into a remodeled bathroom or kitchen can definitely make your property stand out from the competition. For those who have just purchased a home, remodeling affords them the ability to put their stamp on the new property. 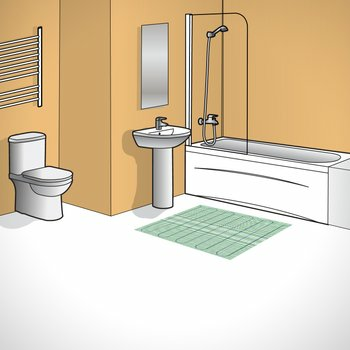 A remodeled room with a floor heating system won’t only look different, it will feel different. Another reason for remodeling is simple maintenance. A floor can degrade from use and the passage of time. This is particularly true for tile floors that can either crack or break at the grout-lines, due to subfloor cracks or foundational movement. 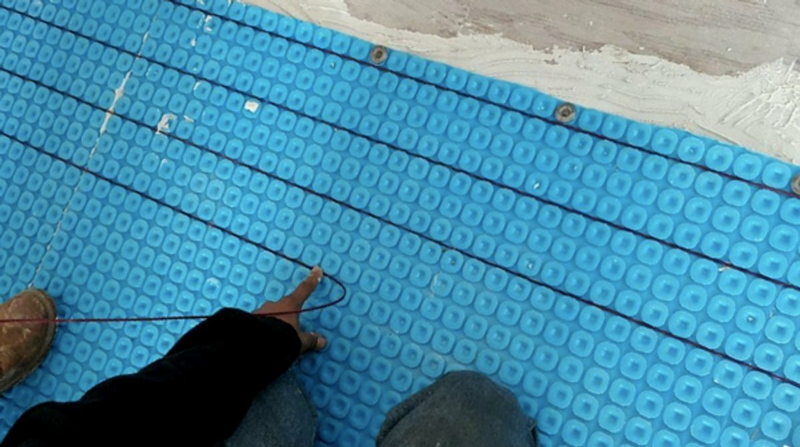 The Prodeso Cable Installation Membrane provides not only an easy way to incorporate underfloor heating, but also uncoupling and crack isolation benefits. These features will ensure that your new floor lasts for many years to come. spot heating in a new addition. also be equally rewarding. Regardless of what type of addition you’re building, you’re probably going to need a new floor. This is a great opportunity to incorporate an electric radiant heating system. The added benefit being that, as long as your addition has adequate insulation, you should be able to rely on your floor heating system to function as the primary heat source. This means you can save the time, hassle, and expense, of trying to extend your home’s existing heating system into a new addition. For more information, check out this post about floor heating FAQs or this post about when remodeling occurs. Next Post Is a Heated Driveway a Good Investment?